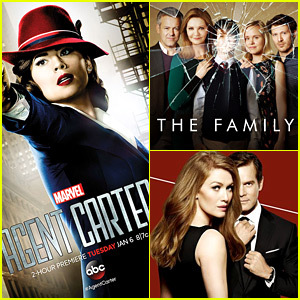 ABC has announced the fate of more of its series and sadly some favorites have been canceled. Marvel’s Agent Carter has been canceled after two seasons while freshman drama series The Family has been canceled after one season. While fans of Hayley Atwell might be upset that she will not return in the Marvel series, her new drama Convinction has been given a series order so she will be back on the network! Shows that have been renewed include Shondaland’s The Catch, the comedy The Real O’Neals, and the drama series American Crime. It was also announced that Shonda Rhimes‘ new Romeo and Juliet sequel series Still-Star Crossed has been given a series order. The series picks up where the classic Shakespeare tragedy left off. It was also announced today that Nashville has been canceled after four seasons on the air. Brie Larson, Carey Mulligan, & Saoirse Ronan Stun at Governors Awards 2015! Brie Larson, Carey Mulligan, and Saoirse Ronan walk the red carpet at the Academy of Motion Picture Arts & Sciences’ 2015 Governors Awards on Saturday night (November 14) at the Ray Dolby Ballroom in Hollywood. All three of the ladies are contenders for the Best Actress award at the Oscars next year and they all looked stunning at the event! Brie was joined by her Room co-stars Joan Allen and Jacob Tremblay, who are both getting awards buzz for their performances as well. FYI: Brie is wearing a Calvin Klein Collection dress, an Edie Parker clutch, and Carbon & Hyde jewelry. Carey is wearing a Jonathan Saunders dress, Aquazarra shoes, a Tyler Alexandra clutch, and Anita Ko jewelry. Saoirse is wearing an Emilia Wickstead dress. Room's Brie Larson Stuns at Her Big L.A. Premiere! Brie Larson looks beautiful on the red carpet at the premiere of her movie Room at the Pacific Design Center on Tuesday (October 13) in West Hollywood, Calif. The 26-year-old actress was joined at the event by her co-stars Jacob Tremblay, Joan Allen, and William H. Macy (with wife Felicity Huffman). Brie, who is the frontrunner for the Best Actress prize at the Oscars this year, is featured on the cover of Variety‘s new issue. She opened up to the mag about working with her eight-year-old co-star Jacob. FYI: Brie is wearing a Rodarte dress and Paul Andrew shoes. Brie Larson is all smiles while sharing a fun moment with her co-stars on the red carpet at the Room premiere on Tuesday (September 15) in Toronto, Canada. The 25-year-old actress was joined by Jacob Tremblay and Joan Allen for the 2015 Toronto International Film Festival premiere held at the Princess of Wales Theatre. Brie opened up to IndieWire about how she transformed her body for the role of a woman being held hostage in a room for years with her young son. “The difference is that…my weight is the same, technically I lost 13 pounds of fat, but I gained 15 pounds of muscle, so my body looks the same, but the difference was I had muscle from doing track and doing push-ups in Room all the time and constantly carrying Jack,” Brie said. “He is a five-year-old boy who has a ton of energy, constantly needs to be wrestled with and moved around, and I wanted to be able to feel that. Not only could I be physical with him, but that I could protect myself and him if that man came in and did some funny business. Brie Larson proudly displays her IMDb Starmeter award on Monday (September 14) at Brassaii restaurant during the 2015 Toronto International Film Festival in Toronto, Canada. The 25-year-old actress received the award which recognizes stars who are lasting favorites on IMDb’s STARmeter chart. The award is truly one from the fans, as it is determined based on the site’s actual user activity. Earlier in the day, Brie sat in on the press conference for her upcoming film Room. She was joined by director Lenny Abrahamson, actors Jacob Tremblay and Joan Allen, as well as screenwriter Emma Donoghue.